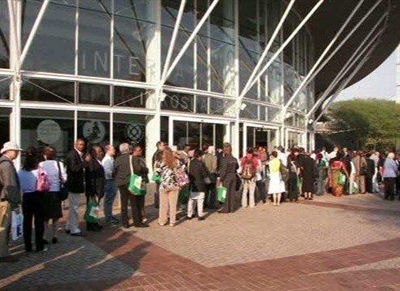 A sense of spiritual renewal flavored this summer’s 20th World Methodist Conference in Durban, South Africa, attended by 1,850 people from 58 nations. “When you are in the pew passing the peace with somebody from Nigeria on one side of you and somebody else from Korea on the other, you get a glimpse of what the kingdom of God is truly about; and you realize that our differences are not important,” observed Carl Bergeson, a lay leader from First United Methodist of Ocala. Starting the day at the World Methodist Conference in Durban, South Africa. Bergeson, along with Walter Dry, Sharon Luther and the Rev. Audrey Warren, served as delegates from the Florida Conference to The World Methodist Council. The council, which launched in London during 1881, links believers with a shared spiritual heritage dating back to John Wesley. It unites 500 member churches in the Methodist/Wesleyan family for support, education and the sharing of ideas and resources for serving and making disciples of 75 million people. Bishop Ivan Abrahams, presiding bishop of the Methodist Church of Southern Africa, was elected as General Secretary of the Methodist World Council. He replaces Dr. George Freeman of the U.S., who is retiring after 10 years of service. Reflecting the growth of Methodism in the Southern Hemisphere, Bishop Paulo Lockmann of the Methodist Church of Brazil was elected president of the Council, replacing Dr. John Barrett of the Methodist Church of England. The Council adopted a revised constitution, the result of a long-range strategy committee headed by the Bishop Sarah Francis Davis, AME, Jamaica. Three new churches, including two birthed by Korean missions, joined the Council as new members: The Methodist Churches of Gambia, Nepal and Tanzania. The Council approved a five-year budget, ranging from $722,100 in 2012 to $769,818 in 2016. A resolution was passed asking member churches to raise $20 million during the next five-years for the WMC Foundation endowment, covering Council operating expenses. The resolution proposes that the funds could be raised if each of the 40 million Methodists and Methodist family members worldwide made a gift of 50 cents per person over the five-year period. The World Fellowship of Methodist and Uniting Church Men committee reported on a program in cooperation with Stop Hunger Now, which calls on Methodists to “Fast, Pray and Give”: give up one meal per week, pray during that time of fasting for those who are hungry, and give the cost of that meal to organizations combating hunger. The Committee on Social and International Affairs called for a resolution speaking out against the treatment of the Palestinians in Israel. The Committee on Ecumenism presented three reports detailing its work with the Roman Catholic Church and The Salvation Army. The committee also reported it has been invited to open a dialogue with The Eastern Orthodox Church. Roman Catholic Rosalind Colwill received the Methodist Peace Award for 30 years of work with the mentally ill in Nigeria. In addition to the formal meetings and presentations, the conference included opportunities for informal relationship building, prayerful reflection and study of the Methodist tradition and history of the host city. 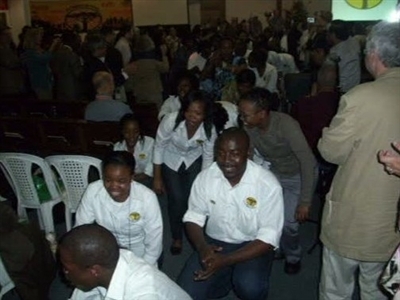 Praise and worship at the World Methodist Conference in South Africa this summer. For both Bergeson and Luther, the conference broadened their understanding of the scope and reach of Methodist ministries. Florida delegates witnessed an opening ceremony featuring the procession of banners from each World Methodist Council member country, and participated in a local mission project to assemble 100,000 bags of food.